Is climate change beating nuclear reactors, even while the nuclear lobby claims it’s the other way around? There are many records of nuclear reactors being shut down due to jelly fish. Jellyfish are causing mayhem as pollution, climate change see numbers boom, ABC, RN By Hong Jiang and Sasha Fegan for Late Night Live 6 Jan 19 Jellyfish have been around for at least 500 million years — they’re older than dinosaurs and even trees.Science writer Juli Berwald calls them “ghosts from the true garden of Eden”. In fact, the brainless, spineless, eyeless, bloodless creatures are booming in numbers — and causing mayhem around the world. Their propensity to breed fast and prolifically means jellyfish can disrupt ocean ecosystems in a flash. And their effects aren’t contained to the sea. 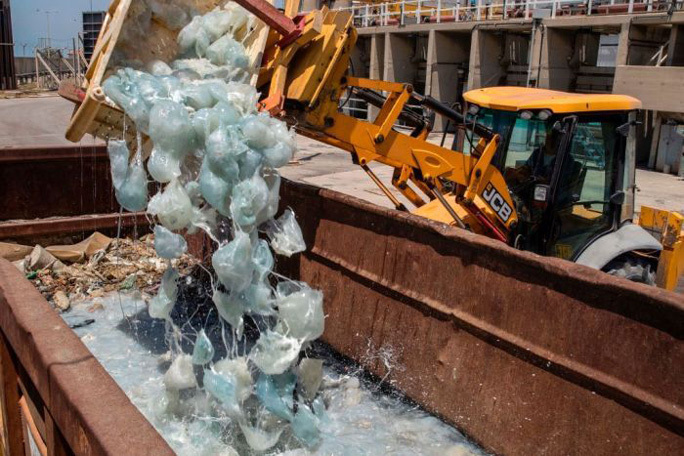 In places like Sweden, Israel, the US and the Philippines, power plants have been affected by blooms of jellyfish. Jellyfish have also caused plants to shut down in Japan. “One jellyfish scientist from Japan told me that the first threat to the electric system in Japan is earthquakes, but the second is jellyfish,” Berwald says.